In 2008, then HRM Mari asked me to join her Queen's Artisans. This was a singular honor which I accepted. Part of being a Queen's Artisan was to research a set project, present a class on the topic, and exhibit. Although we were encouraged to finish the project during her reign this was not a requirement, fortunately. My project inspiration is the portrait to the right. It was posted by Katherine Barich in the files of the German Renaissance Yahoo Group. For 5 years it niggled at me and here was the opportunity to create it. 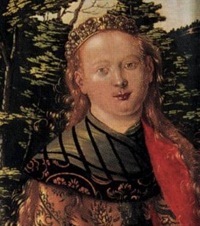 This portrait appears in 2 books according to Katherine - pg. 403 of Milla Davenport's "The Book of Costume" (ISBN 517037165) as XVIc 1548 German (Berlin, Kaiser Fredrich Museum) Unknown Saxon Artist. Portrait of a Woman and "Masterworks of Berlin, A City's Painting Reunited" by Colin Eisler, pg. 145, South German Master 1548. Click here for an enlarged version of the portrait. In many ways this portrait is apparently an anomally. Gollars are rarely closed or as conical. Nearly all the gollars are shown open in front. 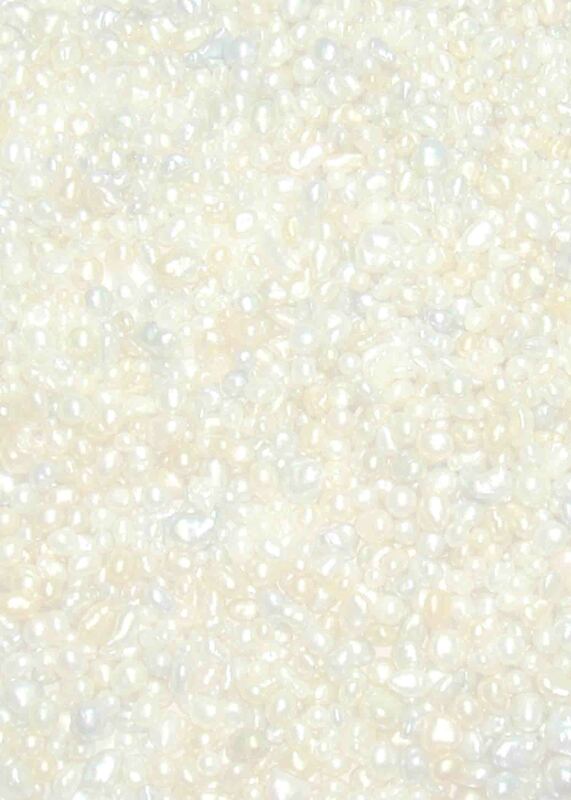 I have found no other white gollars nor any as richly embroidered. The class I gave as a Queen's Artisan was an overview of pearl embroidery with a focus on Pearl Sticken which was given at March Crown. Since my presentation contains many images which are under copyright, I am not willing to put it here on the website. If you are interested, please contact me and we will try to work out an arrangement. 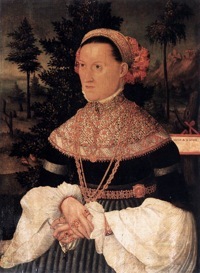 Textiler Hausrat mentions that Gollars can be seen as a component of feminine clothing in Durer's costume study of 1500. 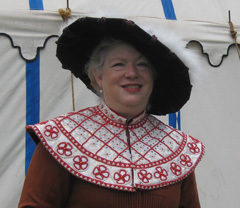 While primarily a fashion of the first quarter of the 16th C, it does continue until 1570's. Even women of lower middle class standing were permitted gollars made of "Atlas, Damaskat, or other silk fabric" and were noted in inventories as damask or atlas and fur lined. (pages 80-83 translated by Katherine Barish, located in the Yahoo Group files of Jutta Zander-Seidel's "Textiler Hausrat, Kleidung und Textilien in Nurnberg von 1500-1650", ISBN 3422060677). There are 9 pictures of gollars in these pages as well as numerous footnotes to historical inventories. The main extant piece of coral embroidery is a late 16th/early 17th C. chasuble at the Art Institute of Chicago - item 1965.773. As mentioned on the Research page, the coral beads on this piece are 2-3 mm in size. The initial design of the gollar was much closer to the original. After much soul searching I chose to create a gollar with designs which were more symbolic to me. The lower band was switched to represent my status as a member of the Order of the Golden Poppy; which is represented by a 4 petaled gold/orange flower. 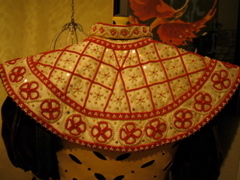 I kept the basics and design layout of the gollar - the bottom wide band, the angled squares, the front opening, the collar, the conical shaping, the beads off the bottom, the triangle bands of alternating pearls and coral, the use of spangles to add richness, and the floral patterns in the squares. The balance of pearls and coral beads was also a consideration. I was unable to find coral beads in an elongated fashion so the floral designs were swapped - fresh water pearls for the petals and coral for the insides. The triangle bands and bead extention off the gollar are as close to the original as I could make them. The original shows no opening in the gollar. Since gollars traditionally open in the front, the design was set to mimic the original in that the sides come together and continue the pattern from one side to the other. The base fabric is silk duchess satin. The backing fabric is silk velvet. The pearls and coral are 2.5-3mm. While much of the beadwork on the portrait is not clearly defined, the beadwork in the base set triangle of 3 beads alternating coral and pearls is fairly well represented as are the beads in the cuffs. Knowing that 2-3 mm pearls were used on garments (see research page), I searched for beads in this size range that would set out this pattern. Further, taking measurements from the neck to shoulder and given approximate sizing, the beads on the portrait appear to be in the 2.5-3mm range. Spangles are 14k gold size 8 which are approximately 4 mm. The spangles in the portrait are a little bit larger than the beads. 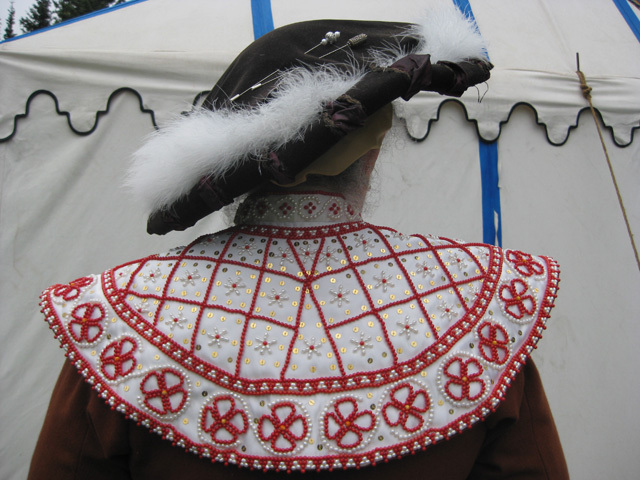 Silk thread was used to sew all the beads; primarily white for the pearls, red for the coral, and gold for the spangles. The slate frame was framed up with heavy weight muslin from England. This is a specific type and weight used for goldwork and other heavy beadwork projects. The silk satin was then applied. 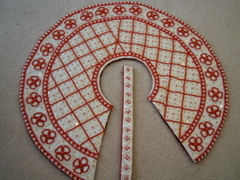 A pattern for the gollar was constructed out of fabric. The outline of the pattern was then transferred to the silk with chalk. A tissue paper version of the pattern was used to set out the main design lines and assist with transferring them to the silk. 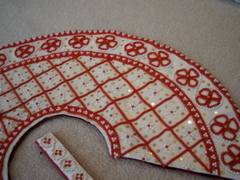 The first step in beading was done with couching down straight lines of beads. First the beads are strung on silk cording. 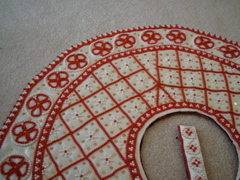 Then there is a couching stitch between each bead. The beginning and ending threads of the cord are plunged to the back and secured in place. Next came the outer wide band with the poppy emblems. The poppies beads were strung and tacked down to allow them to move with the gollar. Then the rings of the triangle bead patterns where in each bead was set in individuall. This was followed by filling the "squares" with the floral motifs. Then spangles were added in each square for richness. The original is also mimiced here with 8 spangles being set out in each square. The collar is a separate piece. In the original any separation is disguised. The design for the collar follows the head band of the original portrait in its curves. 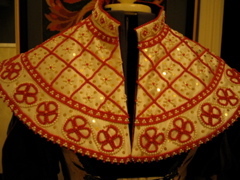 Once both the body and the collar were beaded, the silks was removed from the frame. The backing fabric was cut and applied to both pieces. Each piece was individually sewn together. Then the final set of coral beads were applied to the edge of the gollar where they extend off the edge.